Portmagee is a picturesque fishing village in the very South West corner of County Kerry, Ireland. The village is located on the Iveragh peninsula and is the gateway to Valentia Island, The name Portmagee (Port Magee) comes from the exploits of Captain Theobald Magee, a notorious 18th-century smuggler. Having served in the army of King James as an officer, Captain Magee ‘retired’ to a life of merchant shipping between France, Portugal and Ireland. Thanks to the many inlets around the South West coast, his trade in contraband spirits, textiles, tea and tobacco was hard to police and therefore very profitable. He married Bridget Morgell, the widow of a rich Dingle merchant and also the daughter of the then representative for Dingle, Thomas Crosbie. 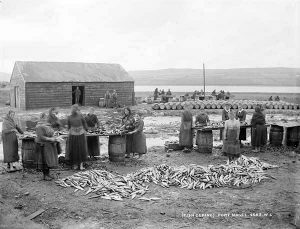 Following Captain Magees death, Bridget and her sons continued the family business of smuggling and Portmagee itself developed into the fishing village as we know it today. Portmagee is a renowned tourist location and for many good reasons owing to its natural beauty, vibrant community spirit and the warm and friendly welcome experienced by all visitors to our wonderful home beside the sea. Portmagee was in fact awarded the inaugural Fáilte Ireland National Tourism Town Award in 2012. This was a fitting recognition in a village that prides itself on both its aesthetic beauty and friendly, genuine people with our unique traditions and customs. Portmagee is the main departure point for trips to the UNESCO world heritage site ‘Skellig Michael’, an island off the coast featuring a 6th century monastic settlement. Skellig Michael (from Sceilig Mhichíl in the Irish language, meaning Michael’s rock), also known as Great Skellig, is a steep rocky island in the Atlantic Ocean about 9 miles (14.5 kilometres) from the coast of County Kerry. It is the larger of the two Skellig Islands. Founded in the 6th century, for 600 years the island was a centre of monastic life for Irish Christian monks. The Gaelic monastery, which is situated almost at the summit of the 230-metre-high rock became a UNESCO World Heritage Site in 1996. It is one of Europe’s better known but least accessible monastic sites. Since the extreme remoteness of Skellig Michael has until recently discouraged visitors, the site is exceptionally well preserved. The very spartan conditions inside the monastery illustrate the ascetic lifestyle practiced by early Irish Christians. The monks lived in stone ‘beehive’ huts (clochans), perched above nearly vertical cliff walls. Portmagee village itself is also the principal port of call for South Kerry’s small fishing fleet with approximately 80% of the fishing fleet regularly docking at Portmagee to unload their Wild Atlantic catches. Just to the West of Portmagee pier, another Island monastery, Illaunloughan, is located, a gentle and beautiful reminder of the history flowing through the channel that so famously Captain Theobald Magee would land his illicit trade. Portmagee community revolves heavily around the two main sports in the region, Irish Gaelic Football and traditional South Kerry rowing. The Portmagee football team is called ‘Skellig Rangers’ and proudly wears the Green and Gold colours, which are often seen flying from various flags and jerseys adorning the village throughout the year. Portmagee Whiskey’s colours of Dark Green and Gold celebrate our villages sporting life. A vibrant nightlife in the local pubs is punctuated with traditional Irish music and dancing as well as much laughter giving any visitor a true sense of the Irish character and spirit. It has simply to be experienced to be understood and once experienced, people only ever want to come back again and again. Portmagee has a heart and character like no other place on this planet and Portmagee Whiskey is proud to pay homage to this character with our own unique Irish Whiskey collection.